If you’re considering becoming a carpenter, it’s important to understand what training course you need to take that will get you the qualifications you need to be able to enter the workplace. In the UK the leading vocational training body is the City and Guilds; they are the industry recognised body for setting out the course syllabus, to get you into the workplace with the right level of skills you’ll need to enter the trade. If you have a City & Guilds qualification employers will understand that you have been trained to the required skill level to be able to work competently on site. So before you enroll on a carpentry course make sure the course provider is City & Guilds accredited, that way you can be sure of getting top quality training. In regards to carpentry, the City & Guilds 6217 Carpentry Certificate is ideal for training people who have no previous knowledge of carpentry. The courses can last from 6 – 8 weeks if you take the full time intensive option or most training providers will let you spread them over 12 – 18 months depending on your personal circumstances and course provider. To obtain a City & Guilds 6217 Carpentry Certificate you must complete 8 units with 6 being mandatory and 2 optional that you may choose. Once you have successfully completed the 9 units you will be awarded your City & Guilds 6217 carpentry certificate, by your training course provider. 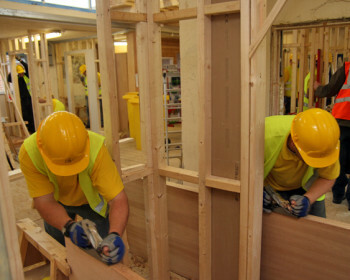 On completion you now would have a national recognised City & Guilds Technical Certificate which proves you have undergone the latest industry approved training to be a competent carpenter, to be considered a fully qualified carpenter you should now try to obtain something called a National Vocational Qualification (NVQ). Basically an NVQ is a work based qualification that once achieved shows that you have proven you can put into practice the skills you have learned on the City & Guilds course in a real life work space environment.